The citral content is a natural occurrence in this subspecies of Basil. It is in fact a hybrid of Ocimum Americanum and Ocimum Basilicum. Sometimes it is mistakenly referred to as lemon balm which is an entirely different plant. The properties usually attributed to other basil oils are also consistent with this pleasant variety. A terrific essential oil to add to natural cleaners. Digestion: Basil essential oil is also used as a digestive tonic. Since basil oil has carminative properties, it is used for treating indigestion, constipation, stomach cramps and flatulence. It provides immediate relief from the gas in your stomach and intestines. 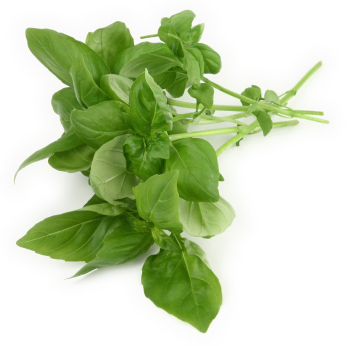 Cold: Basil essential oil is effective in providing relief from cold, influenza and associated fever. Due to its antispasmodic nature, it is used in case of whooping cough. Respiratory: Apart from its usage in cough, it is used for asthma, bronchitis, and sinus infections. The compounds like vitamin-C, Camphene, Eugenol and Cineole present in the essential oils of Tulsi (Basil) do not only cure the infections in lungs but also cure congestion of the lungs. They are also found effective in healing damages caused to the lungs due to smoking, tuberculosis, lung cancer etc. It also helps cure tuberculosis due to its antibiotic properties. Infections: Basil oil is good for treating a variety of infections such as cuts, wounds, skin infections, bladder infections, etc., due to its antibacterial properties. It is also good for viral infections. The anti-inflammatory properties of holy basil extract can help to loosen any buildup caused by the infection and make it easier for the body to expel the results of the infection. This action helps to relieve the stress put on the respiratory system and clear the way for healing to take place. Stress disorder: Basil essential oil has a refreshing effect and hence it is used for treating nervous tension, mental fatigue, melancholy, migraines and depression. Due to this calming nature of basil essential oil, it is widely used in aromatherapy. Its regular use gives mental strength and clarity. Blood circulation: Basil oil improves blood circulation and thus helps in increasing the metabolism. Pain relief: It is analgesic and provides relief from pain. Hence it is used in arthritis, wounds, injuries, burns, bruises, scars, sports injuries, sprains, headaches, etc. Eye treatment: It is ophthalmic and hence relieves bloodshot eyes. Anti vomiting: Basil essential oil can be used as an anti vomiting agent in motion sickness and many other vomiting cases. Skin Care: People who suffer with skin conditions such as dry skin can often achieve a measure of relief by using holy basil extract. When taken in conjunction with calcium, phosphorus, carotene and Vitamin C, holy basil extract can help to hydrate the skin. Not only does this help to alleviate itching and soreness, it also can help to slow the aging process by helping the skin to remain supple for a longer period of time. Cosmetics: Basil essential oil is used topically to massage the skin. It enhances the luster of dull looking skin as well as hair. As a result it is extensively used in many skin care supplements that claim to improve the tone of your skin. It is also used for acne and skin infections. Anti-Aging: Vitamin-C, Vitamin-A, Phytonutrients and the essential oil in Basil are excellent antioxidants and protects the body from nearly all the damages caused by the free radicals. In Ayurveda, it is considered as a tonic to retain youth and avoid aging. Cautions: Basil essential oil and basil in any other form should be avoided by pregnant and breastfeeding or nursing women. On the other hand, some people suggest that it increases milk flow.